Amphibians evolved as the first terrestrial four-limbed animals in the Devonian period (408-360 million years ago). The 4000 modern species form the smallest class of living vertebrates. Modern amphibians are a group of very diverse creatures distributed in terrestrial or aquatic habitats in every continent except Antarctica. Newts and salamanders are elongate animals with short limbs, frogs and toads hop or crawl on very long hind legs, olms and amphiumas look like snakes or eels. Their adaptations for life in a terrestrial environment include limbs and air-breathing lungs. The name amphibian refers to the fact that most species lead a �double life� - adults live on land, larval stages are aquatic. However some species live their entire lives in water while others live entirely in damp environments on land. Surprisingly, some toads have behavioural adaptations enabling them to survive in deserts. Amphibians have a highly permeable skin through which they can obtain oxygen but which makes them very susceptible to water loss and is the reason why most members of the class are confined to damp or wet environments. They are cold-blooded creatures unable to regulate their own temperatures. All kinds of amphibians undergo metamorphosis - an abrupt transformation from larva to adult. This process distinguishes the class Amphibia from all other classes of four-limbed animals or tetrapods. In many cases, metamorphosis accompanies a move from an aquatic stage to a terrestrial life. Order Anura: Frogs and toads. 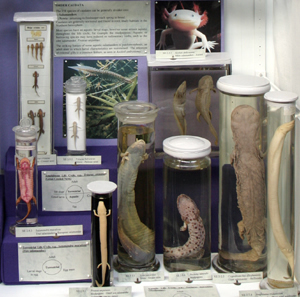 Order Caudata: Salamanders & newts.